During volleyball practice I got smacked in the jaw and was in a lot of pain. 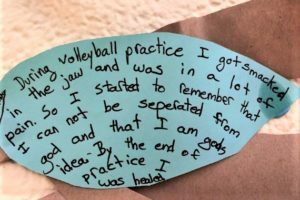 So I started to remember that I cannot be separated from God and that I am God’s idea. By the end of the practice I was healed. 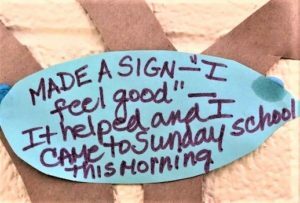 I MADE A SIGN–“I feel good”–It helped and I came to Sunday School this morning. Last night Mason was in the living room and he hit his knee really hard, and he was crying. SO I went in my room with Cole and I started to pray. When I came out of my room Mason was better. 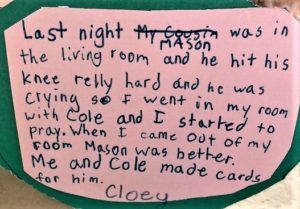 Me and Cole made cards for him.